Sunday, oh beautiful Sunday. At about 11h30 Kerry-Anne and I paid R10 each to take a walk up Tygerberg Hill. 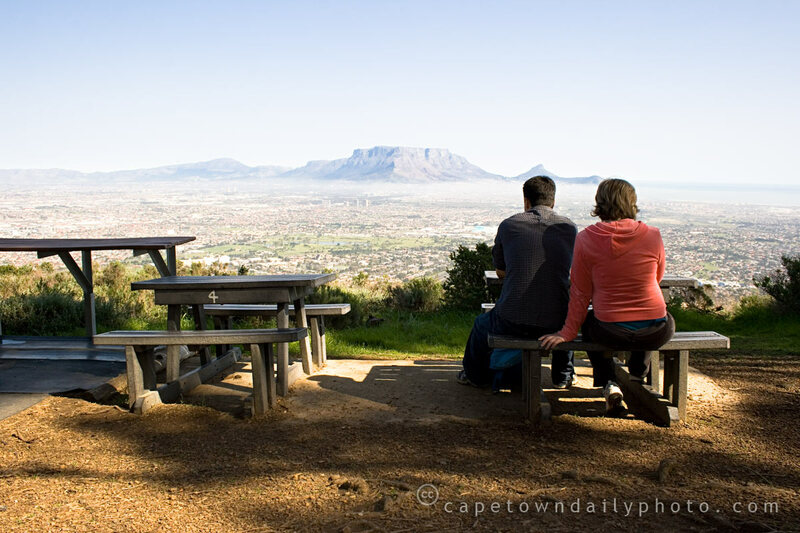 Although the top of Tygerberg Hill wasn't crowded by any means, I never realised just how many people walk up for Sunday afternoon picnics. The spring weather was absolutely perfect. No wind, not too hot, clear skies. If you haven't taken a walk up this little bump rising above the Cape Flats, you really should. Pick a warm day with little wind, take some food along and spend an hour or two admiring the 360-degree views. Take a look at this map; I've placed the cursor in the centre of the screen exactly where this lookout point is on Tygerberg Hill. Posted in Landscape and tagged people, table mountain on Sunday, 16 August, 2009 by Paul. Tygerberg hill nature reserve FTW! I walk up there regularly, I think I’ll go again this Sunday as well! You can see everything from up there! I also usually take my camera along and take some shots! Oh wow that looks beautiful, Robin and I must definitely go! I didn’t know you could go up there (you know what I mean). From where do you start? I regularly take the wrong turn and end up lost, having to track my way back. I think I have it down now though. Sitting there with a glass of wine looking at that view seems very appealing..